I’ve been rather slow in posting on my travels this year, I’ll try and catch up before the end of 2016, starting with a recent week in Sudan. I started and finished in Khartoum, the capital city, and travelled around North Sudan in between. 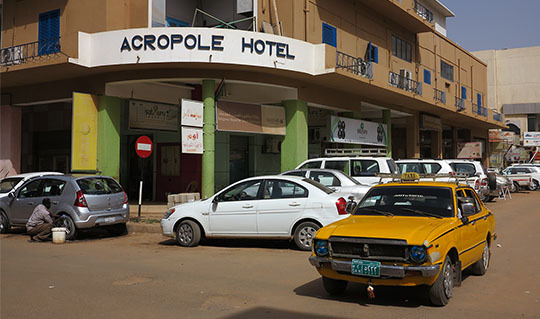 ▲ Getting a visa can be the biggest problem for travel in Sudan, I got mine through the Acropole Hotel which seems to be a popular stop for journalists and archaeologists. 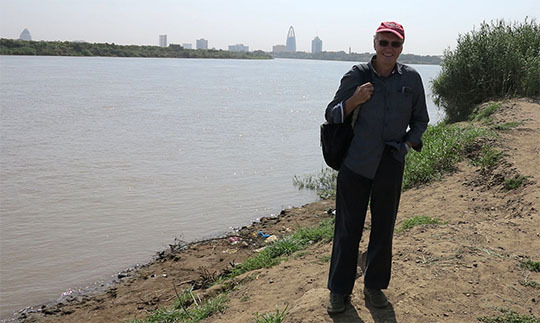 ▲ Here I am on day 1 in Khartoum with the Nile River behind me just below where the Blue Nile merges with the White Nile. 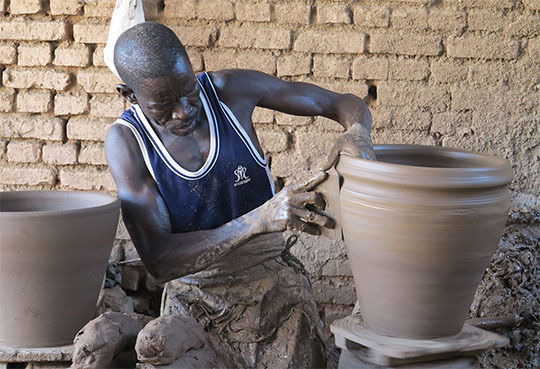 ▲ I went all around the city on that first day, including to a place where they make these beautiful water pots. 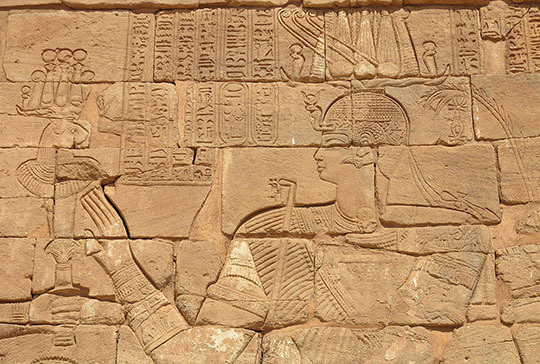 ▲ There were beautifully carved bas-reliefs all around the temple. 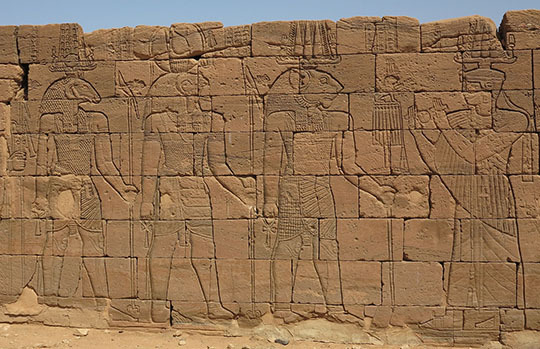 From the left Amun the ram-headed God, Horus the falcon-headed God and Apedemak the lion-headed God and the king making offerings to them. ▲ We continued on to Musawarat with another Apedemak Temple with more wonderful bas reliefs. 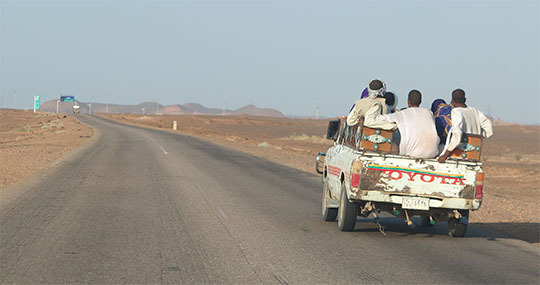 it’s about 35km off the road to Naqa, 15km to Musawarat and then 20km back to the road, so a reasonable excursion. And it definitely needs 4WD, there are some very deep sandy patches to churn through, which my driver Michel managed with alacrity. If you didn’t have a local driver and didn’t know which of the numerous turns to take a GPS location would be useful as well. 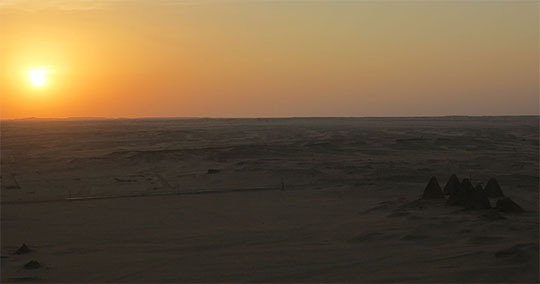 ▲ overlooking the Meroe Pyramids, here they are at sunset. ▲ Egypt has a few big pyramids, Sudan has lots and lots of smaller ones. 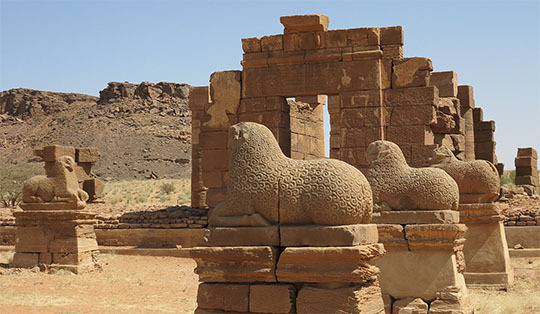 Many of the pyramids at Meroe are square topped because of Giuseppe Ferlini, an Italian treasure hunter who came by in 1834 and lopped the tops off looking for treasure. Naughty man. Wikipedia describes him as a vandal. 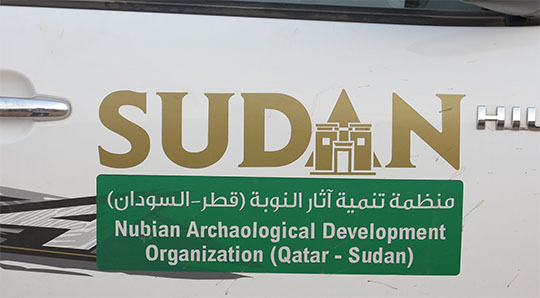 ▲ If shiny new 4WDs are a sign of how much money is going in to Sudan archaeology then there is lots of cash being spent. 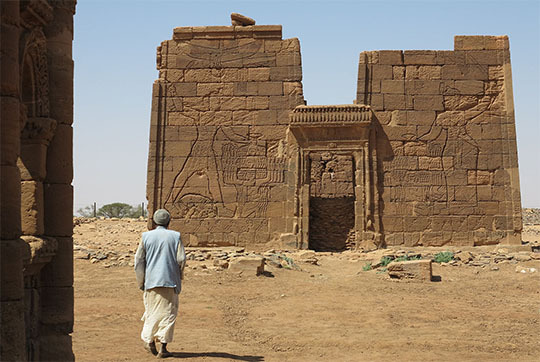 ▲ From Meroe we carried on to Karima and El Kuru with a crumbling pyramid and a number of tombs, most of them broken and open. 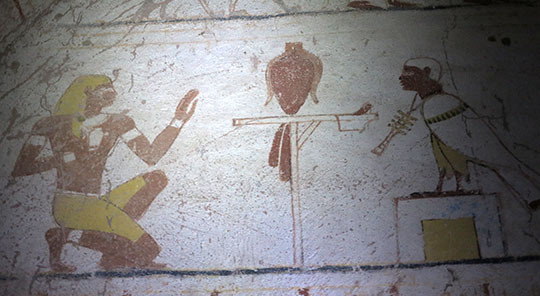 Two of them still have well preserved tomb paintings although we could only find the man-with-the-key for one of them. ▲ At nearby Nuri there was another big group of pyramids, kind of lost in the desert. 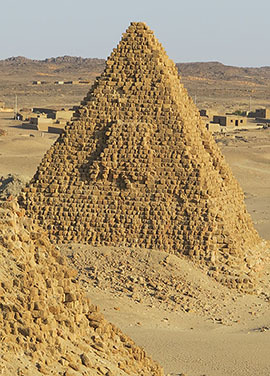 ◄ My favourite Nuri pyramid. ▲ Jebel means ‘mountain’ in Arabic and the Jebel Barkal is an outcrop near where I was staying in Karima. 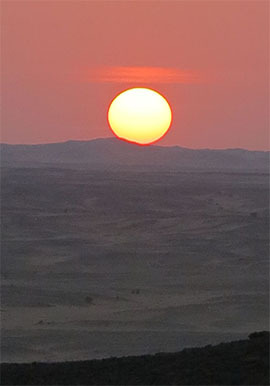 We got back just in time for me to climb it for the sunset and look out over another group of pyramids. ◄ Before a really beautiful sunset. ▲ Next morning I could look back to the Jebel Barkal from the Nubian Rest House, which was rather beautiful too. 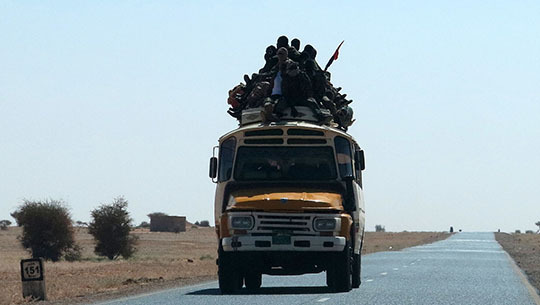 ▲ Finally we drove back to Khartoum, at one point several buses came by each with a rooftop load of soldiers.